A Haydns' Microcosmos: Joseph's Borrowings from Michael...? The occasion of composition of a well known series of early Symphonies by Joseph Haydn is still a blurred territory. Hence the difficulty in defining the story behind the Symphony Fire has been and still is the matter of study for many important Haydn specialists. At this point, Blazin opens an interesting chapter about the life of Michael Haydn, in particular, the lesser known early years, from the Vienna period to the beginning of his musical activity in Salzburg. Haydn's Symphony Fire... Who really wrote what? So: who really wrote what? (D) on the basis of the Quartbuch and of a close stylistic analysis we may conclude that the archetype is the earlier version of this Finale as found in I:B2 and was probably composed by Michael Haydn even as early as 1763. Furthermore, the similarities between Joseph Haydn's Finale of his Symphony Fire and Mozart's Violin Concerto K207 (ca. 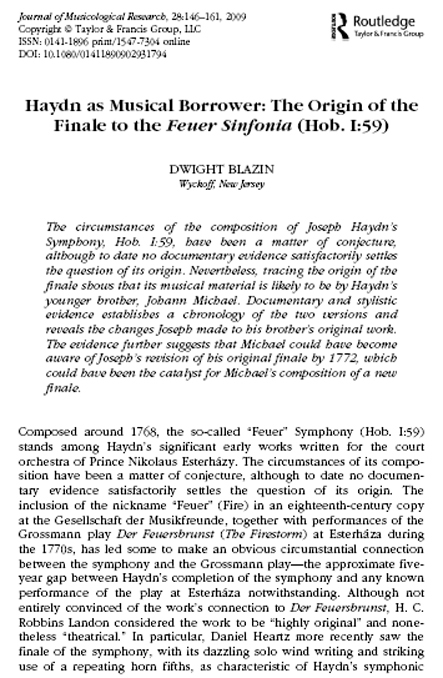 1773/1775) may give an idea how far this 1763 Finale of Michael Haydn's Symphony I:B2 has travelled throughout the years.